This Cranberry Sauce with apple and orange has less sugar. It’s a healthier version of the Thanksgiving classic and it’s vegan, gluten and wheat free!! You’d think that a simple recipe like this cranberry sauce wouldn’t inspire much drama, but I am all fired up. You’ve been warned. This cranberry sauce recipe is all about healthy and seasonal. 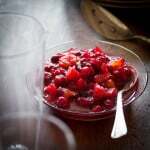 First of all it is based on local and seasonal ingredients, Vermont cranberries and apples. Secondly, it is for Thanksgiving, my favorite holiday; A symbolic and literal celebration of the harvest from the local farmers. Third, and most important, this recipe is also about getting healthier food onto the table for every meal. Even Thanksgiving, the most indulgent meal of the year. Don’t get me wrong. I do like to eat (way more than usual) on Thanksgiving, but I am not of the mentality that since I am eating a plate of food the size of a Mini Cooper, I might as well blow it all out and eat French’s-Onion-laden-modified-food-starch-casserole. I pretty much stick to my guns and keep it healthy. It isn’t even about calorie counting either. It’s about the choices I have made to eat healthfully. I said something on my Facebook Fan page a week or two ago about this, and it bears repeating.There is a difference between being on a diet and eating healthfully.I do not believe in diets. I have tried them and they don’t work (for long) and they are hard. Today, I don’t ever think of eating healthfully as a prison sentence, something I have to get through, or something that is finite (the way a diet can be seen.) I think of it as a no brainier. Like why wouldn’t I want to eat this way? I’m not saying it is always easy to source and prepare healthy food. I am saying making the choice to eat healthy food is easy. The reason is that, as long as I can make healthy food taste just as good or better, why wouldn’t I choose the healthier option? I get that not everyone loves Brussels sprouts the way I do. [Believe me I do. I was a personal chef for years remember? I got to learn that people are all kinds of cray cray about what they will and won’t eat.] Or that sometimes the real deal scratches an itch that an imitation won’t. I am all about enjoying life and having a bit of everything in moderation. I pulled this recipe out of the archives, in part because the old photo totally blew, but also because it perfectly illustrates my point. As I said the first time I posted it, it has half the sugar. I am assuming if you’ve read this far you love cranberry sauce, so we’re not dealing with cauliflower or Brussels sprouts here. I am not trying to convince you to try something you don’t like. I am trying to convince you, and the rest of the world really, that it shouldn’t be a hard decision to make the healthier choice. Even if it may take a few more minutes to peel and chop the apples and orange than it would to dip into the bag of sugar. Why would you need to be convinced to cut out half the sugar? Especially when I am telling you that this tastes good. With the natural sweetness of the apples and the heady flavor from the allspice and orange zest, you won’t miss the extra sugar. If the things that are stopping you are mental. Meaning, would you feel deprived knowing it has far less calories? Or worse would you feel like that gave you license to eat twice as much? I hope not. I have been there myself and I totally feel your pain. If these sound like thoughts that may creep into your mind, I would strongly recommend reading Intuitive Eating by Evelyn Tribole, MS, RD. It helped me a ton. And then I would like to challenge you to make this recipe, even do a side by side taste test if that’ll help convince you. I think you’ll see what I mean. No brainier. Gauntlet thrown! 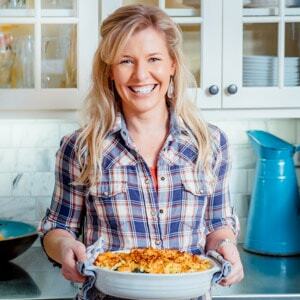 For more healthy (not diet) Thanksgiving recipes click here. 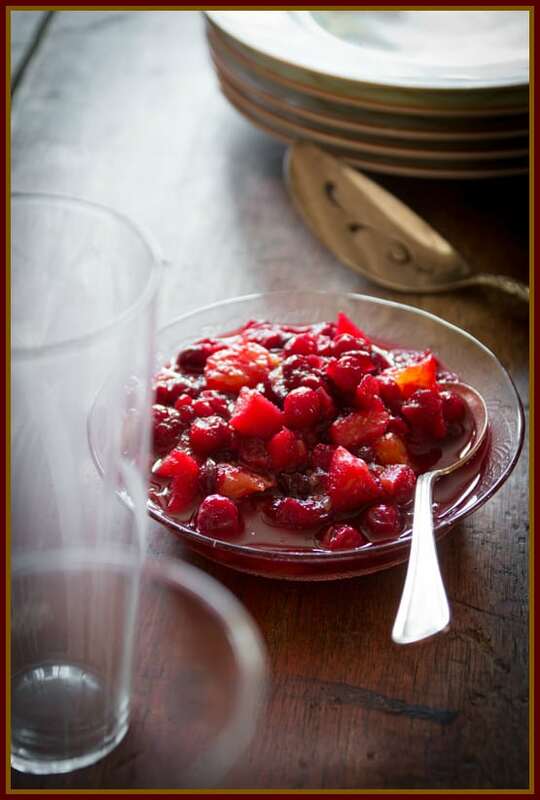 Stir together cranberries, apples, brown sugar, orange juice, allspice and salt in a large saucepan. Place over medium heat and bring to a simmer, stirring often. Continue cooking, stirring often until the cranberries have popped and the mixture thickens, about 5 minutes. Remove from heat. Meanwhile, zest orange. To supreme the orange: Cut skin and white pith off the orange. Cut between membranes to remove individual segments, working all the way around the orange. Gently stir the zest and orange segments into the compote. Discard orange membrane and peel. Cool compote completely, about 2 hours. This post contains an affiliate link, which means that if you click on and purchase the product links, I’ll receive a small commission which helps support the content I bring you. Regan, You’re so right. It doesn’t appeal to me either. I don’t feel deprived about it at all. And I didn’t even bring the enjoyment of cooking from scratch into the convo, but that’s part of it too. Peeling and cutting the apple creates the connection to the food in a way that opening the can of green beans never will. I use brown sugar splenda in the recipe because my sister is so sensitive to sugar. It works great. Also, I make my green bean casserole from scratch and it is much better tasting we think. Fresh or frozen green beans (mine are from our summer garden), fresh mushrooms and caramelized onions. 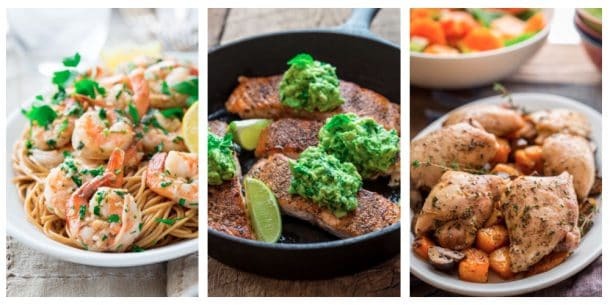 I do use half and half to make the cream sauce so not so low in calories but you only get a small amount in each serving. I love hearing about it Jackie. So great you’re cooking from scratch like that, and even cooler that you rock the home grown veggies! Thank you so much Ari. I am so glad to be in your company. And for the record I would love to come to YOUR table some time! And heck yes to a little home-made cinnamon whipped cream, if that’s what you love. Especially if that means that it is easier to stay on track the remaining 98% of the time. Love this post and so glad you shared it on Healthy Food Bloggers! This is the way I eat, life-long, for health reasons. I remember the first time I made fresh cranberry sauce. I couldn’t believe how much better it was, and now I make it with agave syrup or coconut sugar so it’s even healthier. Your photos are gorgeous, too! Thanks for sharing. I am so glad you stopped by Stephanie. And I am so glad to have found the healthy food bloggers group, and to get support and feedback from others. When I was a kid my mom used to make several different kinds of cranberry sauce. What a revelation from scratch can be. The canned stuff would end up in the compost once the meal was over. I still haven’t tried coconut sugar, but I will have to try it out. Ohhh. Can it be a bright blue one with the British flags on the side view mirrors?? Haha. Glad I made you laugh with that one. “All kinds of cray cray” — OMG, I laughed so hard! 🙂 I love that your cranberry sauce looks not only delicious but also so festive and colorful. Ha ha. Glad you caught that Ninj. And thanks for the props. Much appreciated. I totally agree with your views on Thanksgiving. Sure, I might eat a somewhat massive meal, but I make everything from scratch with fresh ingredients – and I feel pretty good about that. This cranberry sauce looks fresh, healthy, bright and tasty! Yes cooking from scratch is the whole point of it in a way. It is about celebrating the fresh harvest. Thanks so much for coming by. This looks and sounds amazing. I am pinning and sharing this recipe with my readers and making it for my Thanksgiving feast. Thanks so much Sherrie. I just talked to my MIL and I will be bringing this to our meal too. I hope you enjoy it , and thanks so much for sharing. I’m super excited to make this recipe for Thanksgiving! I would like to prepare it two days in advance, is this alright? Does the cranberry sauce store well in the refrigerator? Sarah, It holds up really well. I tested it, and it lasted for a week in the fridge. I hope you enjoy it. So glad you pulled this out of the archives! I made a similar lower sugar cranberry sauce over the weekend with applesauce and orange juice and didn’t miss the added sugar one bit! And I love your anti-dieting stance and couldn’t agree more with the importance of focusing on mindful eating and enjoying the foods you really love. I just wrote my Mindful Monday post today on that very topic. 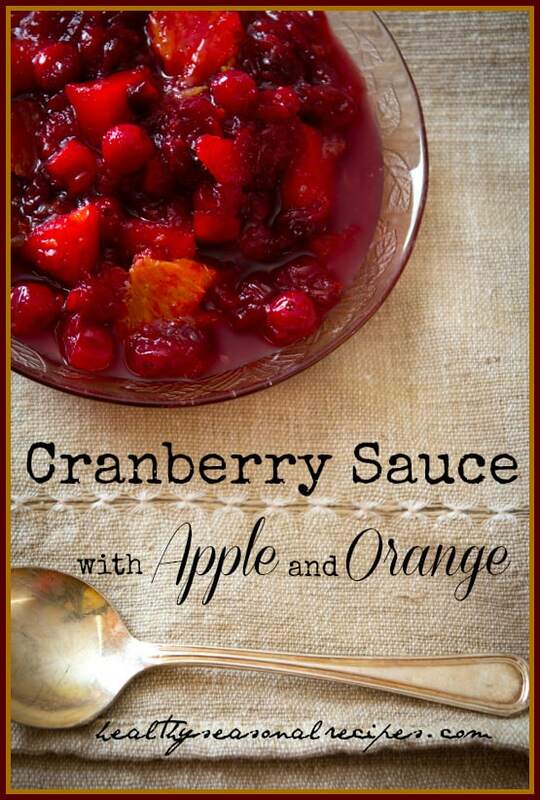 Love a good chunky cranberry sauce, this looks delicious! I also don’t believe in diets, they don’t work for the long run and the heavy restrictions just make cravings/binges worse. Happiness=food. Thanks for this awesome recipe! I’ve been looking for new twists to traditional Thanksgiving dishes, and I like this idea of adding apples and oranges to the sauce! Fantastic!!! I took out the sugar and used honey in its place. Came out perfect. Thank you! Your recipe is timely. I’ve been looking for a recipe with reduced sugar and orange pieces. Which variety of apples works best? granny smith (sour) or red delicious(sweet) or ????? Hi Ellie, More than the level of sweetness it is more a texture thing. So that is up to you and the texture you like. For a chunkier sauce, go for apples that hold their shape while cooking like golden delicious. And if you like a saucier texture, use macintosh. Hope you enjoy it. A yummy addition that I like to use for this recipe is broken pecans. They provide a nice earthy flavor that blends well with the bright fruit tones and adds in some healthy protein.